Masterful design & luxury welcome you in this 4B/3.5B slice of paradise youâll love to call âhome.â This breathtaking contemporary home is filled w/upgrades, panoramic views, extended covered lanai, private 19x26â saltwater heated pool, outdoor speakers, built-in grill/summer kitchen & fireplace, & wrought iron fence, & 52â remote controlled fans/lights. Smart Home security system w/inside camera, motion sensor, deadbolt, 3-way dimmer pkg & programmable thermostat. Interior includes open floor plan w/gorgeous hardwood, a gourmet chefâs kitchen to entice even the most enthusiastic of cooks, SS double/convect oven, countertop stove, expansive granite countertops w/glass mosaic backsplash, lg island/breakfast nook, abundance of 42â cabinets w/crown molding, touchless faucet, lg pantry, triple sliding glass doors , & 69âwindows. The look is completed w/combination iridescent pendant & recessed lighting. Family rm overlooks pool, includes in-wall wiring for TV, in-ceiling Bose surround sound speakers & butlerâs bar. 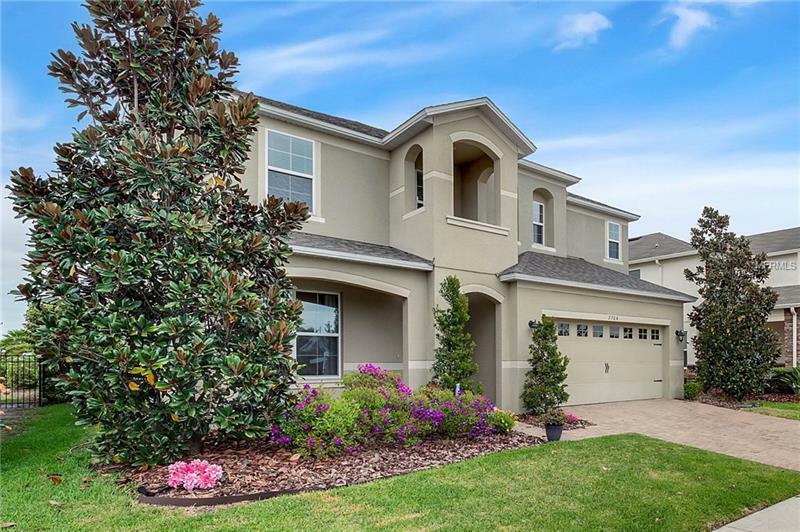 Upstairs includes an expansive loft, breathtaking master w/recessed ceiling, three 69â windows overlooking pool, lg frameless shower, granite counter, dual vanities, ceramic tile flooring, & extra-large walk-in closet. Jr suite includes double closet/full bath. Remaining rooms include double closets/shared bath. Laundry has Whirlpool Duet HE W/D & 30â cabinets. Location benefits include shopping, dining, & so much more. I-4 and Turnpike allow for easy access to Disney, Universal Studios, & City Walk.